Our Honey vs Store-Bought Honey – Southwest Honey Co. The United States domestically produces only about 40% of the honey it uses on a yearly basis; the remaining 60% is imported. In many cases, imported honey has been pasteurized and highly filtered, stripping it of nutrients and enzymes. There have even been reports of honey being imported from highly polluted nations; of which many hard metals, antibiotics and pollutants have been embedded in the honey. 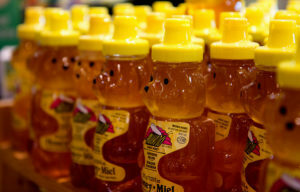 Inexpensive honey found at national chain stores is likely not real honey. Many major manufacturers have been mixing “honey” flavoring and corn syrup, which can be labeled as honey and is produced and sold for a low dollar amount. In fact, it has been reported that as much as 76% of honey bottles on that average supermarket shelves do not contain pollen and are most likely a “fake” honey. Even when you do find real, American honey on a chain supermarket shelf, it has most likely been “super-heated” and “ultra-filtered” of pollen and nutrients. This process is done by major manufacturers to extend the shelf life of the honey without it crystallizing quickly. While these processes don’t necessarily taint the honey, it does remove many of the enzymes, nutrients and pollen we benefit from by consuming honey. Honey never goes bad, but it doesn’t look as great when it isn’t clear, so that’s why it is done. Our honey is bottled raw, fresh from the hive and never superheated, pasteurized or filtered of pollen or nutrients, so it not only has a great taste, it is good for you too! Honey lovers enjoy the unmodified, natural taste of our honey that comes from hives on preserved and organic properties. All of our beekeeping is bee-friendly, so that all of the bees are returned back to the hive as the honey is removed, unlike other commercial operations that may destroy a hive, kill bees or separate a colony to retrieve the honey. Our honey proceeds go towards creating sustainable habitats for honey bees, promoting awareness of their population decline & educating the public on ways they can help.